Pyramid is played with a single, well shuffled pack of 52 playing cards. A pyramid of cards is dealt, consisting of 21 cards formed from six overlapping rows. Each card in the top five rows are blocked by two cards in the row beneath. Both of these cards must be discarded before releasing the card above, making it available for play. The six exposed cards in the bottom row of the pyramid are available for play immediately. 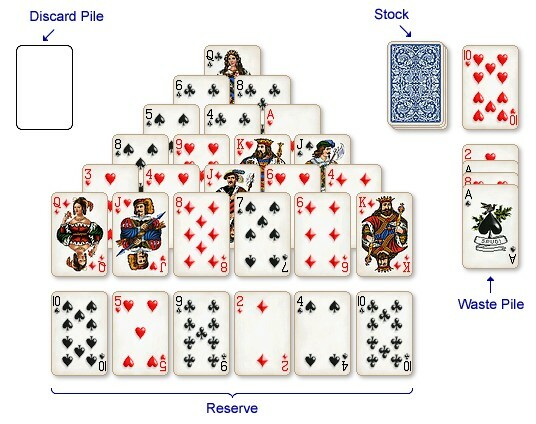 Six cards are dealt to a reserve below the pyramid, each card of which is available for play. Pairs of exposed cards that total 13 are removed and placed in a single discard pile at the top left of the play area. The object of the game is to discard all 52 cards, demolishing the pyramid in the process. Aces count as 1, Jacks 11, Queens 12 and Kings total 13 in themselves and as such, are discarded as a single card rather than as a pair. Cards are turned from the stock one card at a time. If the card cannot be paired with another available card, it is discarded to a waste pile, the top exposed card of which is always available for pairing. At any time, any pair of available cards that total 13, or single exposed kings may be transferred to the discard pile. Available cards are any cards that are completely exposed and include any of the six reserve cards, the last card turned from the stock, the top card of the waste pile and any completely uncovered card in the pyramid. Only the six cards in the bottom row of the pyramid are available at the start of the game, and as they are removed, they make cards higher up in the pyramid available. For a pyramid card to be available, it must be completely exposed by removing the two cards covering it. When the stock has been exhausted and no more pairs of 13 can be found, the game is over. Exposed cards may be turned face down by moving the mouse pointer over them and clicking on them. To discard a pair of cards that total 13, click on both cards (or a single King) to turn them both face down, then click on the discard pile in the top left of the screen. The cards will fly there automatically. If you make a mistake, then you can turn face down cards, face up again by clicking on them once again.